The Martin Las Vegas by Kelly Wearstler (Yay-uh!) — Sukio Design Co.
She's done it again! 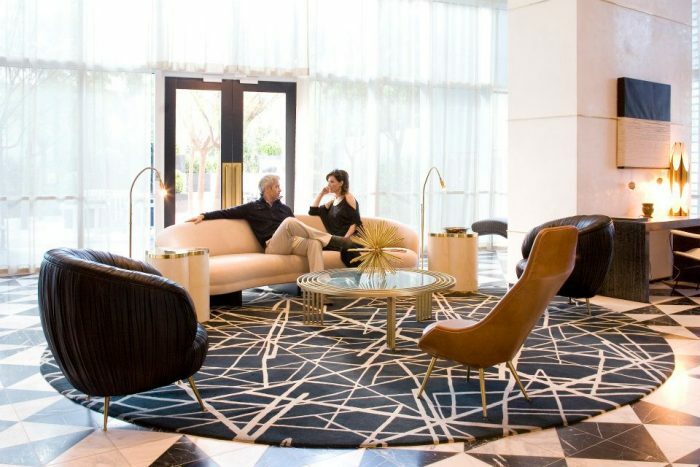 Upon seeing just one pic, I instantly knew the renovated common spaces at The Martin Las Vegas were by Kelly Wearstler. Why, just this week, I used a Kelly Wearstler Groundworks ad on the back of June's Elle Decor to explain her classic elements to the beau. Lo, the very next day, I see photos of The Martin with those same elements on full display. And looking pretty good too! For me, the real kicker is that I could actually afford to live here. I, Desiré Greene, could enjoy these beautiful spaces by a world-famous designer and tastemaker! Ho hum. I’ll never look at my tiny condo the same again. I'm not sure if she had a hand in the outdoor spaces, but they're cool so I added a pic.